The air was crisp and still, and dew coated every surface on which I wanted to place my camera (so that I could capture a steady shot). It was the kind of cold that runs down the back of your neck, and makes your nose so cold that it feels ever so slightly wet. I'm certainly not one for early mornings, but on this particular morning I happened to be awake early enough to have breakfast and capture this scene. 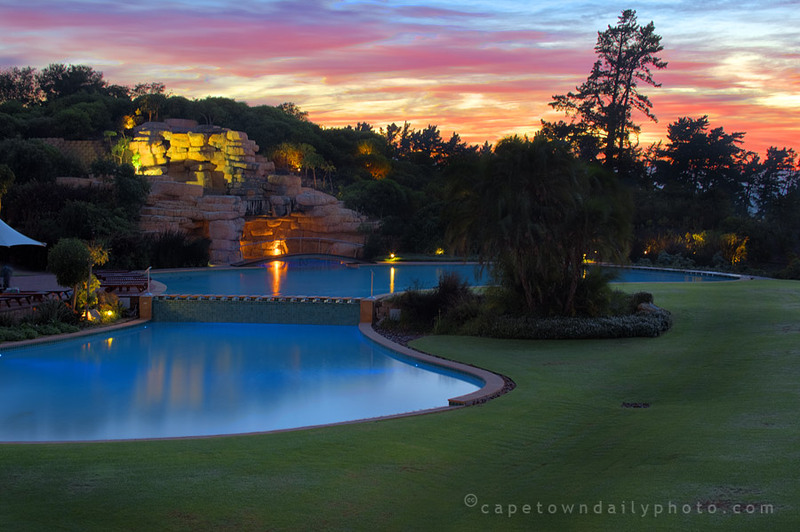 This beautiful lawn, clear blue pool and exquisite sunrise belongs to the Western Cape Hotel and Spa at the Arabella Country Club golf estate, mentioned in yesterday's post. These cool and clear winter mornings are what makes winter special in Cape Town. It's a shame that we can't arrange days like this on demand for tourists. On the one hand it's cheaper to visit South Africa in the winter, but on the other hand if you pick the wrong week you could end up seeing more rain than you'd care to. Posted in General on Saturday, 7 June, 2008 by Paul.